Looking for fun ways to beat the summer heat? 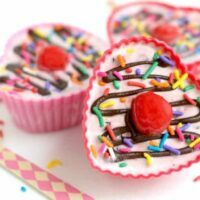 These delicious Cherry Pickin’ Chocolate Hearts will be a crowd pleaser for sure! Whew…summer is HOT here in Florida! Don’t get me wrong, I really love living here, but this time of year we’re always looking for fun ways to beat the summer heat! Luckily I’ve got a few tricks up my sleeve to keep the kids entertained and cool at the same time. Jump in the pool – Need I say more? Besides ice cream, is there any better way to cool off in the summer? If you don’t have a pool in your backyard, your kids will have just as much fun in a plastic kiddie pool! Play “Break The Ice” – Freeze small toys inside of ice cubes and let the kids race to see who can set their toy free first. They can use their hands, sit on them or even try breaking them open. Run around in the sprinkler – This is one of the easiest ways to keep your kids cooled off and entertained. Just turn on the sprinkler and watch them go! Have a water balloon fight – Filling the balloons may take longer than the actual water balloon fight but the kids have so much fun that it’s totally worth it! Go puddle jumping – What kid doesn’t love to do this? We have a lot of afternoon showers this time of year and when they’re over, my four year old loves splashing around in the puddles! Head out to the water park – We’re lucky to live within driving distance of a really great water park in Tampa and this summer we even sprung for season passes. If you live near a water park, it might be worth it to spend the money so that you can go all summer long! Throw an ice cream sundae party – Invite some friends over and let the kids make their own ice cream sundaes! Put out different Blue Bunny flavors, toppings, sprinkles, whipped cream and cherries and let the kids go crazy! Have a water gun war – Make some forts out of whatever you have on hand and see who can out-soak the other! Beach trip – I know this doesn’t work for everyone but if you’re lucky enough to live close to a beach, splashing around in those waves is the perfect way to cool off! The best part for us is that in the summer we can do these things as a family! My hubby works most weekends and so his days off usually fall on weekdays. That means that during the school year we rarely get a full “family day” together. While I don’t always love his schedule, I’ve gotten used to it and it also means that our family days are even more meaningful to us. That’s another reason we love summer so much. Since school is out, there are a lot more “family days” and we can really enjoy our time together…even if we’re just grilling out and playing in the pool! Since we had a family day coming up, I thought it would be fun to make some special ice cream treats! You can never go wrong with ice cream but in the summer it almost becomes a necessity! 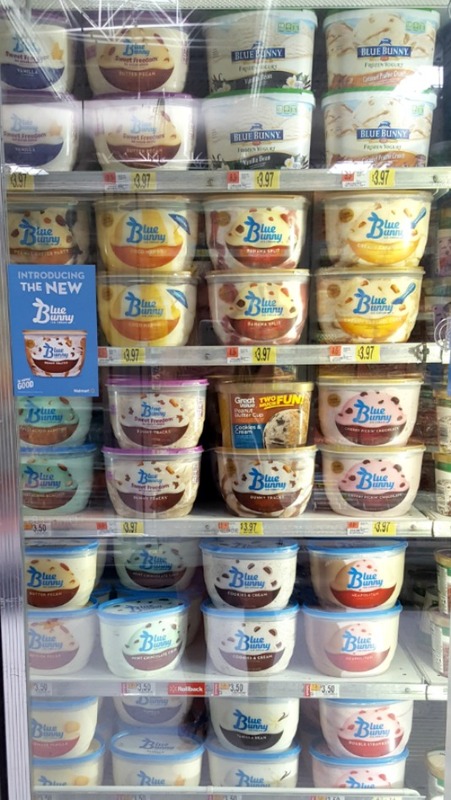 First thing on the agenda…head to Walmart to pick up some Blue Bunny® ice cream and toppings. I love Blue Bunny’s new clear packaging. When I saw the flavor swirls in the Blue Bunny® Cherry Pickin’ Chocolate™, I knew it would be awesome! I couldn’t stop at just one flavor though because they all looked so good! Since my oldest daughter doesn’t like chocolate (crazy, right? ), I bought her the Blue Bunny® Vanilla. My little one has been begging to try some strawberry ice cream so it was only fair that we picked up the Blue Bunny® Double Strawberry for her too. 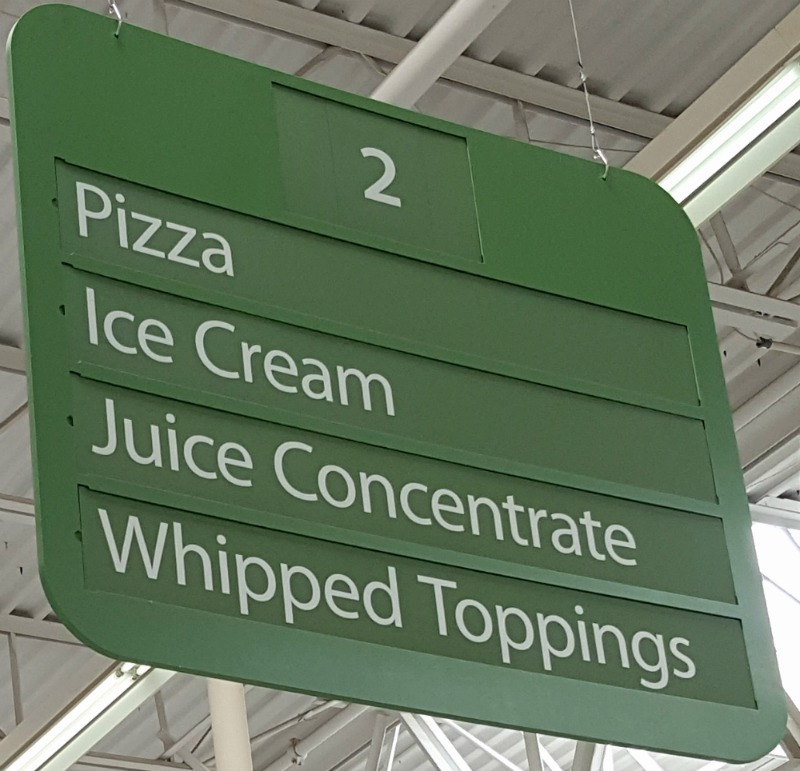 Of course, when you have ice cream, you need a yummy topping to go with it. I’ve always loved Smucker’s Magic Shell Chocolate Flavored topping and it’s a fun, inexpensive way to make your ice cream just a little bit fancier. I couldn’t pass the display without adding a bottle to our cart! Have you tried the new Cherry Pickin’ Chocolate? It’s seriously my new favorite ice cream flavor…it is sooo good! If you like cherries and chocolate, you are definitely going to want to try this! I used it to make some Cherry Pickin’ Chocolate Hearts. What better way to show my family that I love them, right? I grabbed my heart shaped silicone cups, gave the ice cream a couple minutes to soften, then filled each cup halfway. First I conducted a few taste tests, for quality control of course! I froze them again until they were completely solid, then added a layer of Magic Shell Chocolate Topping! Next, it was time for one more layer of ice cream. Finally I topped them off with a little more chocolate, sprinkles and of course, a cherry on top! Now all that was left to do is eat and enjoy! 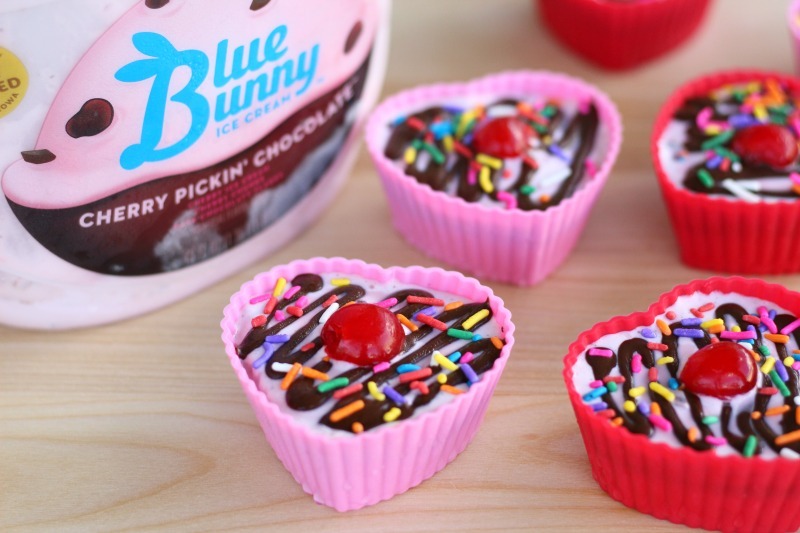 Beat the summer heat with these delicious ice cream treats featuring Blue Bunny's Cherry Pickin' Chocolate flavor! Finally, drizzle Magic Shell Chocolate over the top of each, adding sprinkles and a 1/2 cherry. What are your favorite ways to beat the summer heat? 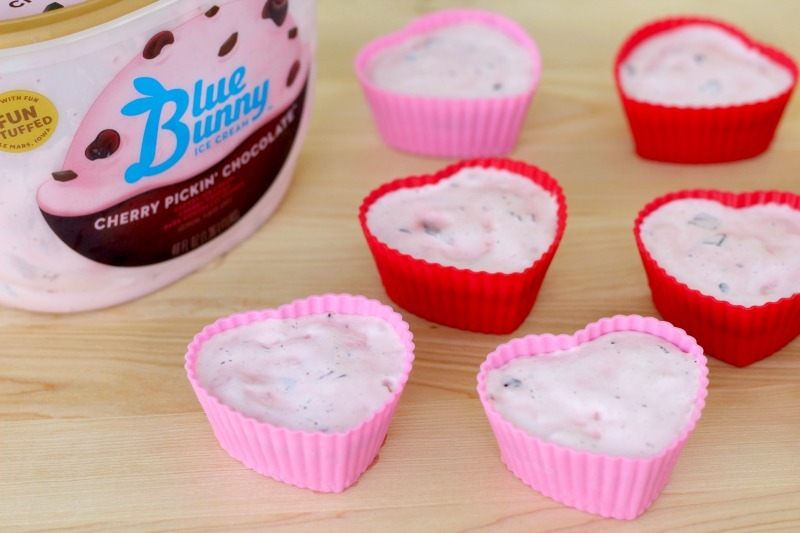 If you said ice cream, you’ll definitely want to check out the rest of these delicious Blue Bunny Ice Cream recipes! 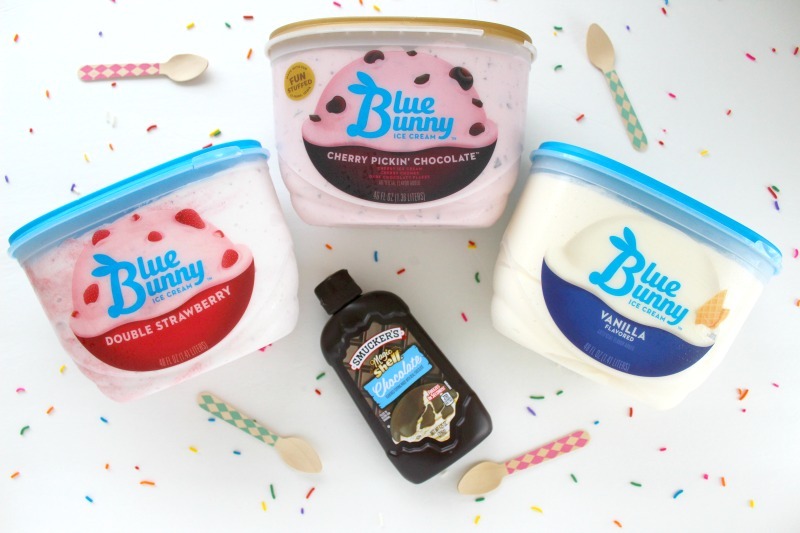 To find out more about Blue Bunny Ice Cream and their delicious new flavors, check them out on Facebook, Pinterest, Twitter, Instagram and YouTube. The chocalate hidden in the middle does it for me. Pinning!! Thanks so much! Yes, I try to add as much chocolate as I can get away with…LOL! These are so cool! What a fun spin on ice cream! Freezing little toys is a great idea! They can use their cute little toy hammers to smash them open. Now I am all for some ice cream in the summer. 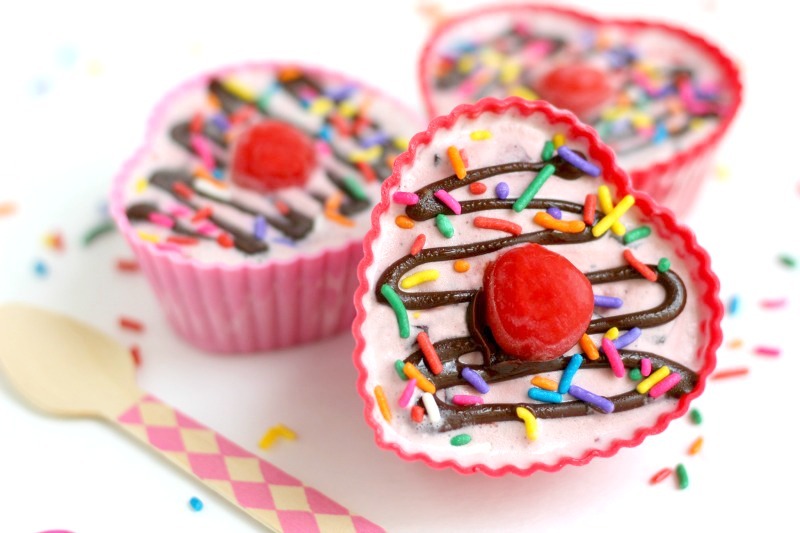 I love that you used heart shaped ice cream cups. It’s always fun to turn our food into cute little shapes! The girls love it! So many great ideas! I love the little ice cream hearts. They are so adorable, and I’m sure they taste delicious as well. Blue Bunny has incredible flavors. You are right about that! I’d never tried the Cherry Pickin’ Chocolate before but it’s so amazingly good…my new favorite flavor. Now that it’s gone (I need to buy more), I’ve been eating the other ones and they’re all delish! Those hearts are so cute! We did something similar for valentines day. My daughter thought it was so fun to eat. What a great idea! These are perfect for Valentine’s Day too! 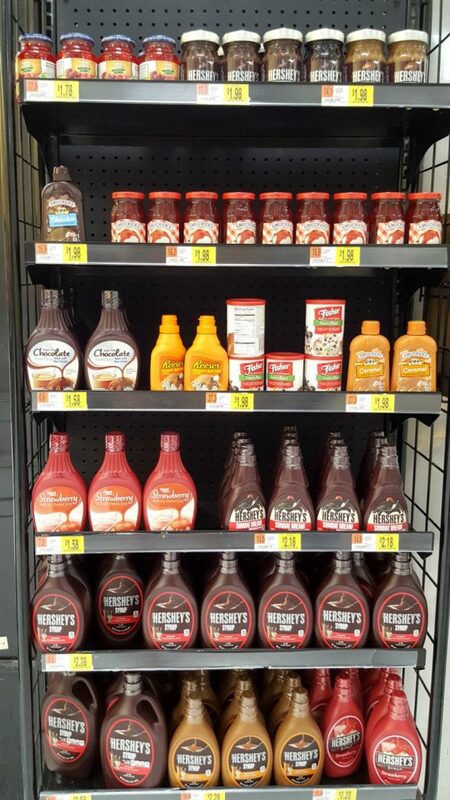 My daughters would be happy to get them for every holiday…LOL! My niece and nephew were visiting last weekend so we all headed into the pool. It was a great way to beat the heat. I had so much fun with them, even if my little niece decided that making Aunt Blythe her personal swimmer was easier than trying to swim herself. Love those ice cream hearts. They are so cute and look delicious. LOL…there’s no resting at the pool when you have little ones! My four year old has finally learned to swim so I can sit on the side and just watch her when I get worn out from throwing them across the pool (their favorite game)! There are so many ways to beat the heat this summer and in terms of treats, nothing can beat the classic favorite! Ice cream will always be my top dessert during the season and I love the idea that you have here! It looks really adorable too. Thanks Amanda! You really can’t beat ice cream in the summer, right? OMG, i’m a sucker for BlueBunny ice cream and this looks ammmmaaazing! We’ve been spending alot of time in the pool and a road trip is in order for next week. I know…me too! Blue Bunny is the best! Have an awesome road trip! Oh my! That yummy recipe looks complicated but actually your explanation shows it’s simple to do! That’s very encouraging! Thanks! Would love to give it a try! Thanks Cara! Yes, it’s actually very easy…you should definitely try it! Those little ice cream treats are just too cute! We spend most of our summer in the pool! Thanks Debra! They were a lot of fun to make! 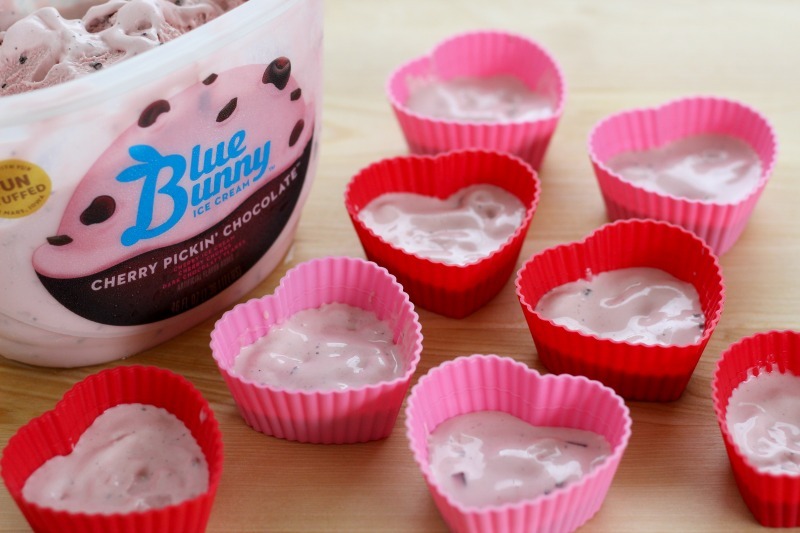 The Blue Bunny ice cream treats look delicious and easy enough for kids to do. It’s so good and yes, the kids love doing things like this! Jumping in the pool is one of my favorite ways to cool off during the summer. We’ve already been in the pool quite a few times this season. I feel you on the heat! My husband (and our family) is stationed in the desert of California, so we’ve been hitting regular temps as high as 117! It is hooooot! So yeah, ways to keep cool is an absolute must! I keep forgetting about the toys hidden in the ice idea. I definitely need to try that. And these heart treats are so cute! They look like they would pop out pretty easily and make some yummy bite-sized treats. I’m definitely going to have to try this! Oh my goodness, that’s hotter than Florida by far! Yes, you definitely need to play the ice cube game and stock up on ice cream! Such a cute and yummy idea! Pinned. These tips sound money-saving to me! 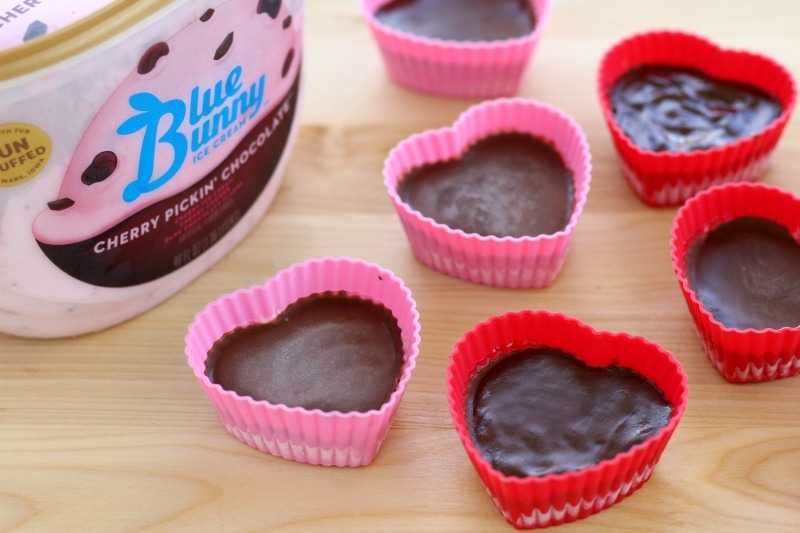 Your Blue Bunny Cherry Chocolate hearts look so yummy! Definitely a great way to beat the heat. I also love water gun/water balloon wars! They’re a great way to have fun AND cool off! Thanks! You can’t ever beat a good water balloon fight…or ice cream!